JAKARTA, Indonesia –Divers reported seeing the fuselage and engines of the crashed Lion Air jet on the seafloor and a ping locator has detected a signal that may be from the cockpit voice recorder, Indonesia's search and rescue chief said Saturday. Speaking on the sixth day of the search, Muhammad Syaugi said that two engines and more landing gear had been found. The plane crashed in waters 30 meters (98 feet) deep but strong currents have hampered the search. 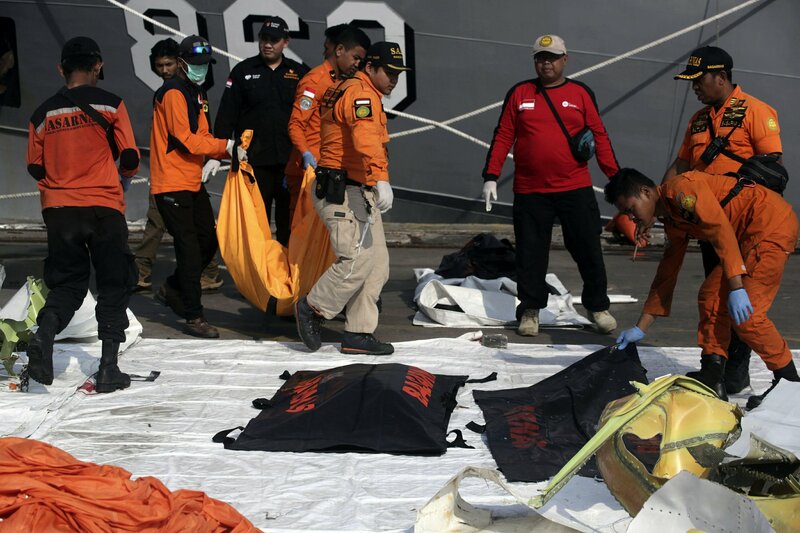 "I haven't seen it myself but I got information from some divers that they have seen the fuselage," he said at a news conference at a Jakarta port where body bags, debris and passenger belongings are first taken. The brand new Boeing 737 MAX 8 jet plunged into the Java Sea just minutes after takeoff from Jakarta early Monday, kiling all 189 people on board. Local media reported Saturday that the search effort had claimed the life of a diver on Friday evening. The flight data recorder was recovered on Thursday and Syuagi said a "low ping signal" was detected by a sonar locator that could be the black box voice recorder. Divers and a remotely operated vehicle have been searching the suspected location since Saturday morning. Flight tracking websites show the plane had erratic speed and altitude during its 13 minute flight Monday and a previous flight on Sunday from Bali to Jakarta. Passengers on Sunday's flight reported terrifying descents and in both cases the different cockpit crews requested to return to their departure airport shortly after takeoff. Lion has claimed a technical problem was fixed after Sunday's fight. Investigators are still attempting to retrieve information from the flight data recorder's "crash surviveable memory unit" that will help determine the cause of the disaster. It has been damaged and requires special handling, they say. The Lion Air crash is the worst airline disaster in Indonesia since 1997, when 234 people died on a Garuda flight near Medan. In December 2014, an AirAsia flight from Surabaya to Singapore plunged into the sea, killing all 162 on board. Indonesian airlines were barred in 2007 from flying to Europe because of safety concerns, though several were allowed to resume services in the following decade. The ban was completely lifted in June. The U.S. lifted a decadelong ban in 2016. Lion Air is one of Indonesia's youngest airlines but has grown rapidly, flying to dozens of domestic and international destinations. It has been expanding aggressively in Southeast Asia, a fast-growing region of more than 600 million people.